Been diving in Casa Cenote? Please Vote! Known as both Casa Cenote or Cenote Manati, this brackish but crystal clear-water sinkhole or cenote is an oasis in the midst of the mangrove, and has a short tunnel that passes through to the Caribbean sea, allowing access to any creature that may be daring enough to pass through. I have had many memorable encounters with unexpected animals, including remoras, tarpon, moray eels, a loggerhead sea turtle, and even a small resident crocodile. The site’s shallow depth and controlled environment provides a perfect place for training. The mangrove environment provides a perfect sanctuary for juvenile fresh and salt water fish, and a truly unique aquascape that’s enhanced by incandescent rays of sunlight that pierce through the tree roots. The bottom content is a mix of sand and fine silt, and large rocks covered in a silky orange algae are encountered along the route, accommodating tiny snails with intricately patterned shells that leave little serpentine trails along the bottom. There are two cavern passages, one is home to a set of ancient turtle bones and prehistoric fossilized corals and crustaceans, and another where you may encounter the phenomenon of a halocline, the layer where salt and fresh water meet. Even though I have dived there countless times, Casa Cenote is one of those places that I fall in love with a little bit more each time I dive there. 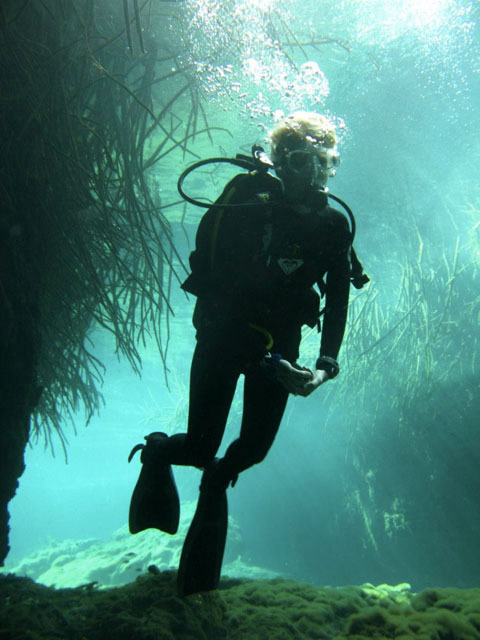 The Author: Sarah Pulitzer, dive instructor and cave diver in Tulum, Mexico. The Tajma Ha dive site will lead you past four cenotes with amazing sunlight beams. Spectacular dive site with a magical hydrogen sulfate layer looking like a cloud with a forest reaching through. Abundant marine life around the wreck and an easy entry if you wish to. Garden of Eden is a truly appropriate name for this idyllic dive spot! Did you dive here with a liveaboard? Please post a comment and share your experience! Diving Casa Cenote (also known as Cenote Manati) feels like being under the jungle! Map of Yucatan Peninsula, Casa Cenote dive site. Did you dive here with a liveaboard? Please share your experience in the comment section!